Twice I have tried a version of the Atkins diet. Twice I have lost 10 pounds. And Twice I have gained 15 pounds back. So I’m not usually an Atkins advocate. But a recent study I read has swayed me a bit closer to low-carb consciousness. It shows a low-carb Atkins diet with a vegetarian twist may help people lose weight and lower their bad (LDL) cholesterol. I know. It doesn’t make sense. Isn’t Atkins all about bun-less burgers and slabs of steak? How do vegetarians fit in here? 47 overweight people with high cholesterol either tried a low-carb diet with vegetable protein or a high-carb, low-fat diet for a month. Both groups took in the same amount of calories, and both groups lost weight and lowered their blood pressure. But: the veggie Atkins people also lowered their levels of bad cholesterol and other heart disease risk factors. So it seems an eco-friendly version of Atkins – stressing plant proteins – is better than a high-carb weight-loss diet at reducing heart disease risk factors. 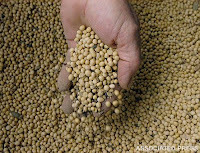 “Soy proteins and nuts were valuable sources of protein and nuts also provided healthy oils. These foods have individually been associated with cholesterol reduction in other studies,” Dr. David J. A. Jenkins said. According to the American Heart Association, having 25- 50 grams of soy a day can help lower bad cholesterol (LDL) by as much as 8%. 1. Sip on soy. 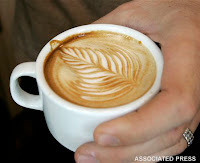 The next time you’re at a coffee shop, ask them to make your latte with soymilk. You may just be surprised by how much you like it! (I originally suggested trying vanilla soymilk, but as one reader noted, all that vanillay goodness is full of carbs so you'll have to stay away from the sweet stuff.) Silk soymilk is probably my personal favorite, but there’s a bunch out there. 2. Snack on roasted soy nuts or edamame to quell your urge for something salty and crunchy. 3. Crumble up tofu and mix it in your pasta and sauce. It takes on the consistency of parmesan cheese. Trust me. You won’t even know it’s there. 4. Toss garbanzo beans into your salad or soup. They’re plump and tasty and won’t overpower your plate. 5. Fake meat. Just give it a try. Go to the frozen food section of your super market and look for the Boca burgers, fake sausages and tofu chicken tenders. You may be surprised by how much you like it! 6. Try soy flour. (OK. So I haven’t tried this yet, but it looks simple enough.) Substitute it for wheat flour for an added nutty flavor. Or toss some in with regular flour to make pancakes. What are your favorite veggie-protein-packed meals? Previous Post: Slimmer summer sips! This entry was posted by kate, on Friday, July 24, 2009. You can leave your response . At any rate, using seafood, cheese, eggs, and then later nuts and legumes, as I reached later stages in the diet, I went for about 6 months again... this time losing 83lbs in 6 months. At that point I think my body had had enough and REALLY put on the brakes. This was about 2.5 years ago. I did put around 20lbs-25lbs of that back on in the time since then but I am working to maintain and lose more now. I should also note that I also exercise regularly, weights, biking, running, and walking, the year that I lost 83 lbs, I biked a total of 1100 miles so not all of that weight loss can be strictly attributed to the diet itself but it definitely helped! Good point about the soy milk! (I just love my vanilla soy milk so much!) And that's amazing how much weight you've lost! I, too, have lost over 100 lbs, but it seems as though our bodies like to go on strike when we get close to our goal weights. Let me know how you're doing losing those last few pounds. It's always so motivating to hear about others' success stories!